Whether you’re a personal collector or the owner of a high-end gallery, the importance of safe art transportation is often overlooked. Transporting sculptures and fine pieces of art can be a very difficult task but is crucial for maintaining the value of the art being handled. Since no two pieces of art are alike, every project requires a unique plan. From the planning phase to the final installation at the new location, safe art transport requires extreme attention to detail. This is why hiring a turnkey contractor for your sculpture moving project is so important for a successful transport. The first thing that needs to be done before rigging, transporting, or installing a sculpture is the site visit. During the site visit, your contractor will be able to figure out exactly how the project needs to be completed. The contractor will observe the surrounding area of the sculpture and create a plan for how to safely hoist it onto the truck that will be transporting it. This includes deciding where the crane or rigging equipment will need to be placed in order to lift the sculpture and taking note of any obstructions that will need to be avoided during the sculpture rigging. Your certified rigging contractor will also need to visit the new site where the sculpture is being relocated. This allows the sculpture rigging company to assess the new site and create a plan of action for how to safely and efficiently re-install the sculpture after transporting it. Carefully creating a plan from start to finish is vital for safe art transport. Sculptures are typically very unique and delicate pieces of art. They vary in shape, size, and weight. Usually, large sculptures are very imbalanced pieces of art, making it especially difficult to easily lift and move them. This means each individual sculpture needs certain safety precautions in order to ensure no damage is done during rigging, transporting, or installation. Your rigging contractor will know exactly what to do when rigging and packaging your sculpture for transportation. They will know the packaging materials needed to protect the sculpture. This may include creating a custom base to lift the sculpture onto or securing it in a padded crate, holding it in place and ensuring it does not move and preventing damages during transport. If you have a sculpture that needs to be moved from point A to point B, your best option is to hire a turnkey rigging contractor. A turnkey contractor will be able to take care of every aspect of your project. From creating a project plan to installing your sculpture at its new location, a full-service rigging company will work with you every step of the way. This way, when installation is complete, you’ll have nothing to worry about. Heritage Industrial Services can provide all forms of rigging, machinery moving, plant relocation, and installation. Our services run the range from removing and installing small individual machines to very large size projects. Sculpture rigging and relocation can be a serious challenge, but with over 90 years of combined experience, there isn’t much we haven’t moved or done. 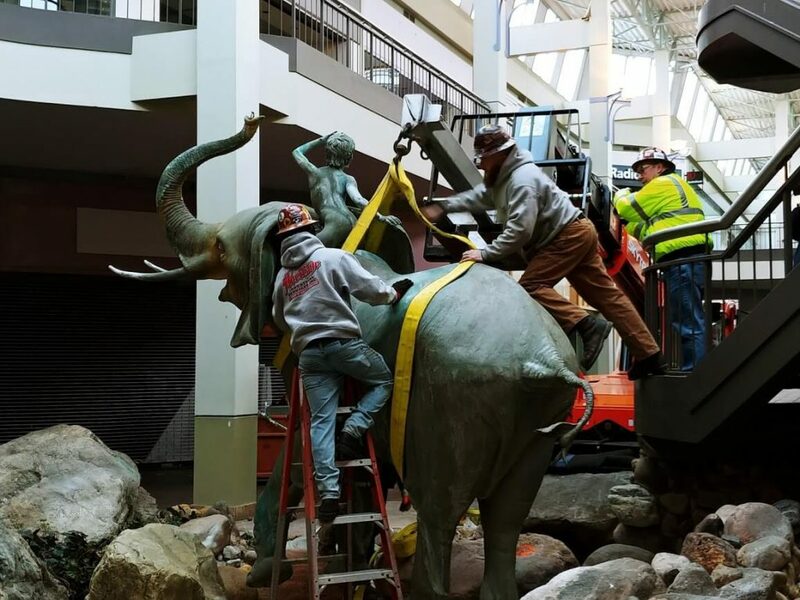 Recently, Heritage Industrial Services safely and efficiently moved a 2,500 lb sculpture of an elephant (as seen in the picture above) from the former Burlington Center Mall to be refurbished and eventually relocated. 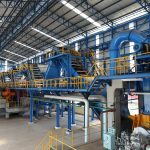 Heritage Industrial’s expert staff employs the most up-to-date equipment and certified safety techniques to ensure the highest quality rigging operations. Heritage Industrial employs certified trained riggers and signalmen for all projects to ensure that all your sculpture rigging needs are performed safely, efficiently, and on budget with no issues. Contact us today to discuss how we can ensure safe art transport for your next project.